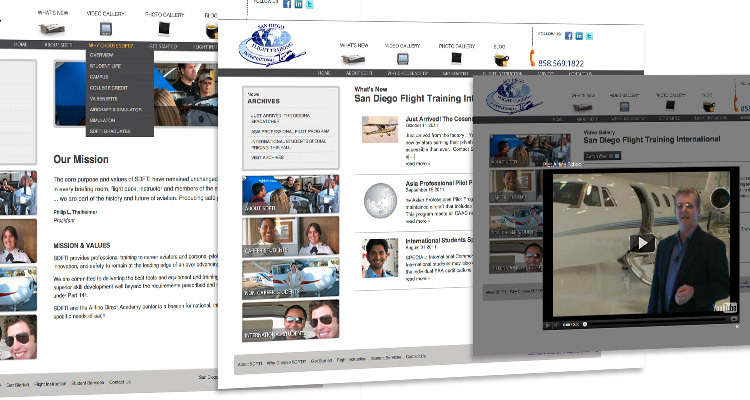 San Diego Flight Training Nobis Kato International first approached Dog And Rooster, Inc. for SEO. We researched their market, prepped their existing site for maximum exposure and were able to get them ranking on the first page of Google searches for their targeted keywords. They saw a difference in the amount of contacts they received immediately. But for the amount of hits they were getting we thought the conversion rate should be better and knew the old, outdated site they had was repelling new visitors. They needed a website redesign. 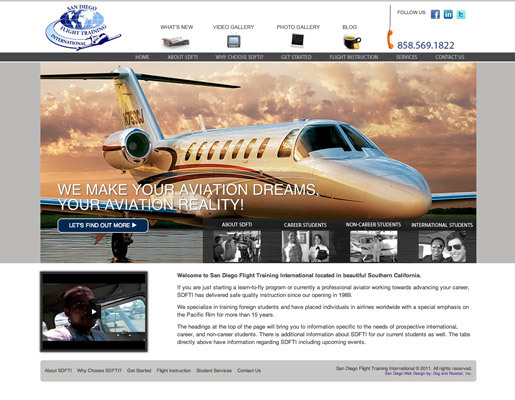 SDFTI’s new website also features a full content management system with dynamic blog modules and gallery. A multi tiered admin also allows SDFTI to assign staff to specific modules (without having access to other parts of the website admin) to update that particular module (a delegation system). So not only did the new site bring in more relevant contact, it also acts to streamline business functions. Next steps for SDFTI include multi-landing page SEO and a dynamic, interactive student dashboard.